Google searches for the leaders of the main political parties soared on the day the general election was called. Searches for David Cameron doubled overnight; interest in Gordon Brown was up 2.5 times; and people Googled Nick Clegg’s name five times as often on the Tuesday as they did on the day before. Gordon Brown has always had problems with Google. Google Autocomplete has for years been very rude about him if you start typing “Gordon Brown is” – although currently the top three suggestions Google offers are that he is a prick, a good Prime Minister and an idiot. Two out of three ain’t bad? And search for his name and, after the Wikipedia entry for the PM, Google offers you the chance to “see results for Gordon Brown estate agents”. Gordon Brown launches new site! Labour has launched a site at www.gordonbrown.org. Actually, I didn’t think that. I thought Cellan Jones hadn’t realised that someone has long been domain squatting that address, which just frames the Labour party site. She had finally got the domain right. However, she hasn’t actually got a blog at that address at all, and there is no real site at gordonbrown.org.uk. In fact, www.gordonbrown.org.uk redirects via a 302 redirect to www2.labour.org.uk/gordon-brown/. And www.gordonbrown.org.uk/sarah redirects to www2.labour.org.uk/sarah. So they haven’t actually launched a new website at all. What they’ve done is announce that the gordonbrown.org.uk domain, which until a few days ago was showing a 123-reg.co.uk domain registration holding page (you can still see the Google cache of that if you’re quick), is now redirecting to Labour Party pages. What’s worse, the page it redirects to is a usability nightmare with a secondary navigation that makes no sense. Go to the Sarah Brown page and it makes even less sense. You can click Sarah, as you can see in the picture, to get back to her main page – but under her picture is the same “what he says” link that makes it look like she’s really a man. Essentially, they’ve employed an idiot for an information architect. Or else they haven’t employed an IA at all. But someone has decided to bodge some pages about Sarah and Gordon Brown together, with no clue as to how anyone can navigate around them or get from back to where they started. People are interested in Gordon Brown. They are interested in his wife. Why not set up a proper Gordon Brown website that actually makes sense and is possible to navigate? The Tories haven’t had a good internet campaign. There was the cashgordon web fiasco, followed by an MP claiming the Tory government “will be the most tech savvy in history“. He then went on to confuse open source with APIs, and crowd sourcing and cloud computing. Prior to that was the MyDavidCameron airbrushed-for-change poster site. Anyway, search Google for David Cameron and he has a website: www.davidcameronmp.com. If you go there, what they actually show you is the David Cameron page from the Conservative party website. In a frame. Yes, remember HTML frames? I can think of no reason to do this – other than that someone has, oddly, decided to pretend that the Conservative party website is Cameron’s personal website on the davidcameronmp.com domain. The side effects of this are that, once you leave this David Cameron page, you can’t get back there using any of the links (well, you can, but you have to know where it is – the page is buried in the People section). And every page of the site appears to be on one URL, so you can’t link to a specific page that you come across, share it or bookmark it. Another side effect of this is that the favicon for the David Cameron site is that of freeparking.co.uk, a domain name registration service. Still, as the davidcameronmp HTML page doesn’t declare a doc type and has a completely empty head section of the HTML, this isn’t a great surprise. The first thing that the David Cameron page we’ve just discussed tells you is, drumroll please, that he has another website at www.witneyconservatives.com. Great! What’s the latest news there? I mean, there is an election. Apparently, Witney Conservatives are having a branch AGM on 24th Feb. Fingers really on the pulse there, guys. So why doesn’t the Witney Conservatives site appear when you search for David Cameron? And here’s the most recent page from David Cameron’s blog on the site. It doesn’t mention the word Cameron anywhere, even in the metadata. That’s right – an entire page about him that doesn’t mention his name even once. There is also a Conservative blog where Cameron, among others, posts under his own name. Here’s a recent post. Again, meaningful HTML titles and remembering to set meta descriptions seem to be beyond these people, so no surprise these pages don’t appear for a search on David Cameron’s name (in fact, only five pages on blog.conservative.com have the word Cameron in the HTML title). Wouldn’t it be simpler and cheaper to do some proper video SEO and get traffic for the main webcameron pages that way? With this many sites devoted to David Cameron, he could own the first page of the results for a search for his name. But the sites are set up in such an incompetent and SEO unfriendly way that he doesn’t. So my advice is to do some proper SEO and, rather than paying for PPC ads, get that traffic for free. This could be one of the fabled efficiency savings you keep saying you can find. OMG. Nick Clegg has a website. A real website. Nick Clegg has two websites, one at www.nickclegg.org.uk and one at www.nickclegg.com. They are all but identical; one has the words “MP for Sheffield Hallam” highlighted and the other “Leader of the Liberal Democrats”. On one, the “Policy guide” is above “Our policies”, it’s the other way round on the other. But otherwise the navigation and content is pretty much the same, as are the meta descriptions and titles. Both sites also have several prominent links that actually take you to the libdems.org.uk site, which wouldn’t be so bad but it’s built using the same template and colour scheme as Nick Clegg’s sites. So when you to the Lib Dem site, it looks like you’re still on Nick Clegg’s site. Only you can’t get back to the home page … I guess this was probably cheaper than designing a new site properly, but it’s probably going to confuse most people. Still, Google seems a bit confused by the near- identical nickclegg.org.uk and .com sites and shows both on the first page of results for a search on his name … Maybe he’s some sort of SEO ninja after all? And he has at least embraced social media. He has a Facebook page (5,090 fans) and a Twitter account (11,029 followers, although he’s fairly upfront it’s run by his web officer) Disappointingly, a cursory check of who he’s followed recently suggests he’ll follow anyone who follows him (including a lot of people with default Twitter avatars), so that 11,029 is fairly meaningless. But at least he’s on Twitter. David Cameron isn’t, and the Conservatives had the unofficial @davidcameron shut down. Nick Clegg also has quite a neat Card.ly page. Clegg’s probably got the best web presence of the three main party leaders. I’d spend a few bob changing his site so it wasn’t so confusingly similar to the Lib Dem’s site. This is supposed to be some sort of watershed digital election (despite the lameness of the parties’ iPhone apps). Clearly Gordon Brown, David Cameron and, to a lesser extent, Nick Clegg have no idea what this means. Still, they probably knew what they were doing when they passed the Digital Economy Bill. Oh, right. 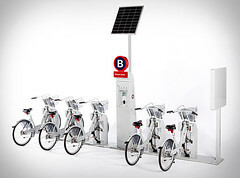 Americans have long lusted after the bikes that are publicly available in many European and Asian cities. This week, we’re getting an extensive bike program of our own. To celebrate Earth Day tomorrow, Denver is launching America’s first city-wide bike-sharing program. They’re working with a company called B-cycle, which is the brainchild of Crispin Porter + Bogusky. An ad agency might not be on the short list of groups you’d predict would get involved in public biking, but Crispin is using its considerable marketing experience to get bike sharing off the ground in the U.S.
Can Google hide from regulators by giving behavioral targeting another name? By now it is clear that privacy advocates and Federal Trade Commission employees don’t like behavioral targeting. Online marketers are increasingly trying to steer clear of regulation on the matter, with clearer opt out policies and self-regulation. Google is going one step further, by trying to rebrand BT with a new name. Today the search giant is opening up its “remarketing program” so that all advertisers can track consumers and serve ads dependent on their browsing history. Calling behavioral targeting by another name isn’t likely to work when regulators come down on the practice of tracking users online for marketing purposes. But at this point, it’s worth a shot. Look on any marketing or web design company’s website and the chances are they’ll claim they do SEO. While some may do great work, some are just chancers. Even amongst the specialist agencies, some businesses are much more effective at what they do than others. But how can you tell the difference between the well-qualified and snake oil merchants?